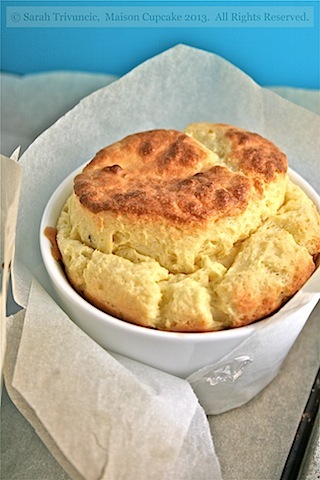 This goats cheese soufflé has gone down a storm in my household – it’s a cross between roux and cake. What’s not to like? Believe it or not, this was my first ever souffle. Both eating and making it. Weirdly, despite my extended travels in France, I don’t recall ordering it on a menu. And I’d never cooked it myself at home. 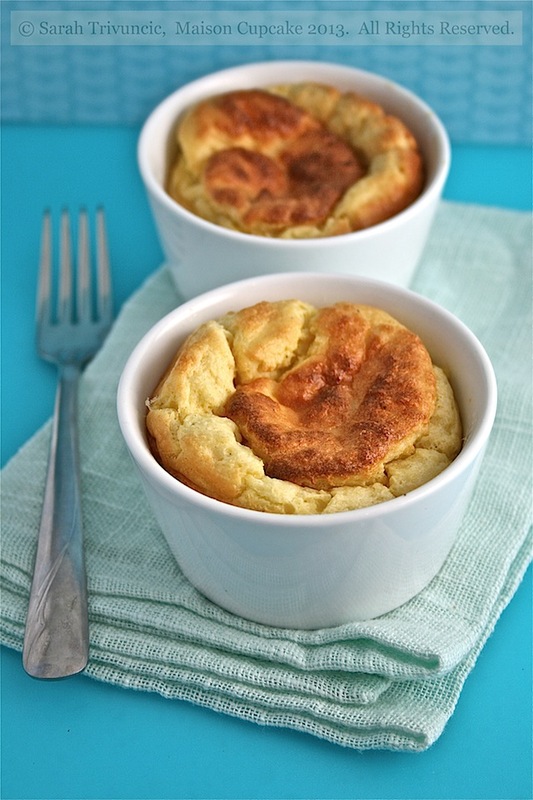 Soufflés have a reputation for being tricky. Admittedly they’re not something you make in advance (although there are various twice baked versions around which purport that you can). I just hadn’t got around to trying them, not cheese varieties, not chocolate, not any souffle whatsoever. 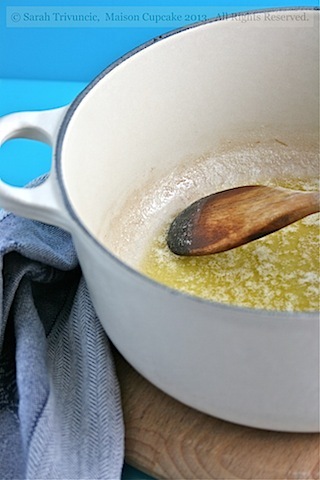 First we start with some melted butter. 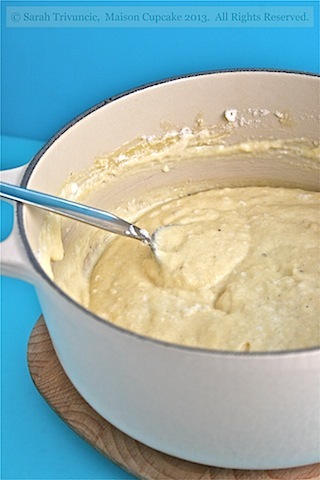 And gradually add flour to form a generous quantity of roux white sauce. A Nigella Lawson style whisk isn’t essential but certainly looks pretty. 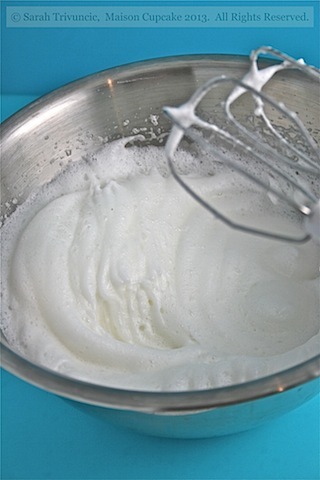 Meanwhile separate the eggs and whisk the whites until stiff but not dry. 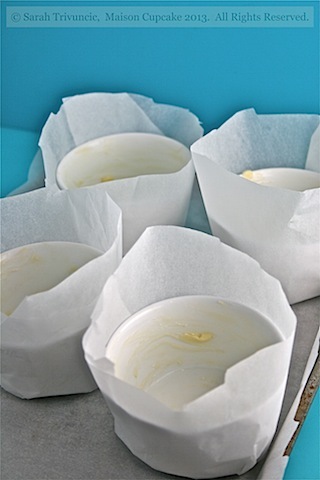 If you live in hope your soufflés will stand up then make little coats to surround your ramekins with parchment paper. 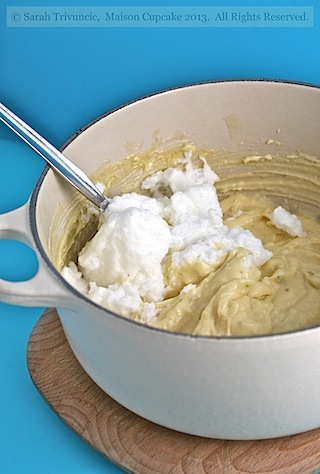 Gently beat the egg yolks and whichever ingredients you are using to flavour the soufflé. In my case today that would be soft goat’s cheese and thyme. When combined fold in the egg white with a metal spoon. You might like to fold the first third in quite quickly before taking more care with the remainder so not to lose air. Spoon the inflated goats cheese soufflé mixture evenly into ramekins. 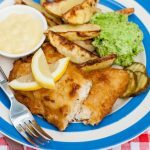 This recipe yields 4 large individual portions or 6 smaller ones. Bake in the oven at 190c / Gas 5 for around 30 minutes. Don’t open the oven door until they’re ready to come out. Ta dah! Now these little babies did hold up their crowns quite nicely for a good ten minutes after coming out of the oven. I will admit though that by the time I’d faffed with photo styling arrangements on props that they’d deflated. A lesson for next time! 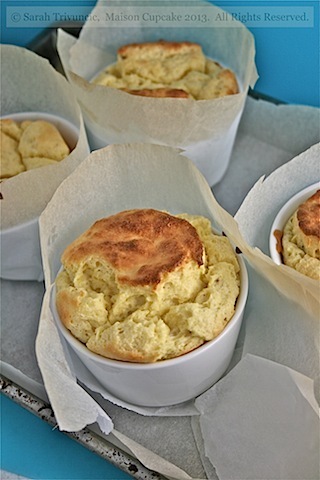 We enjoyed our soufflés for weekend lunch and will DEFINITELY be trying them again. Ted thinks they’re the business and I’m inclined to agree. 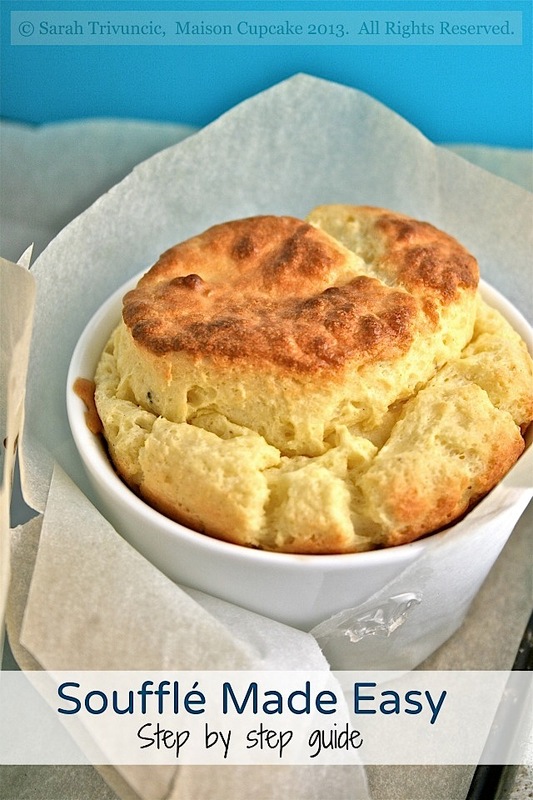 Have you been scared of making soufflé? 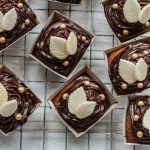 I am sending these goats cheese soufflés to Vanesther for Herbs on Saturday and Jen at Blue Kitchen Bake for her Classic French event which was themed “soufflés” this month. 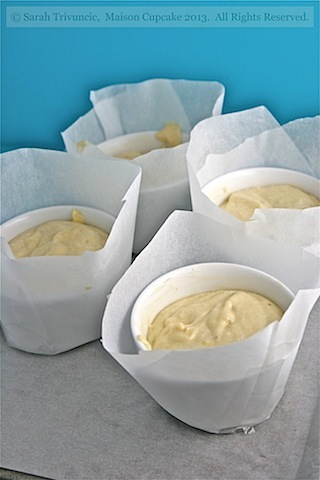 You will also need 4 large ramekins or 6 smaller ones well greased with butter and each surrounded by a cylinder of parchment paper. 1. Preheat the oven to 190c / Gas 5. 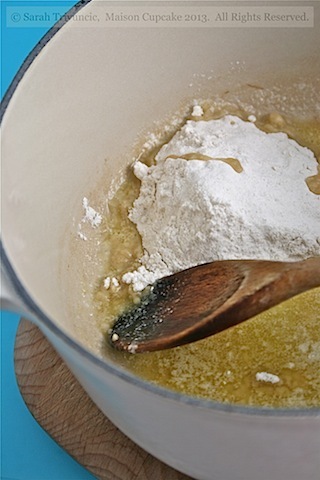 Melt the butter over a medium to low heat and mix in the plain flour stirring continuously. 2. 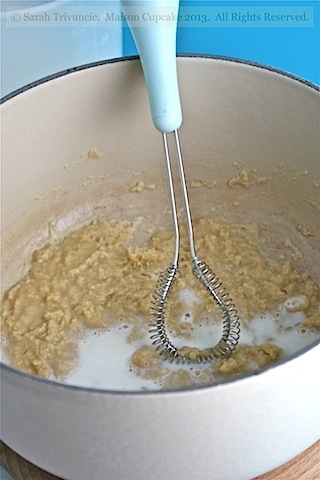 Using a whisk, mix the milk in gradually to form a roux. 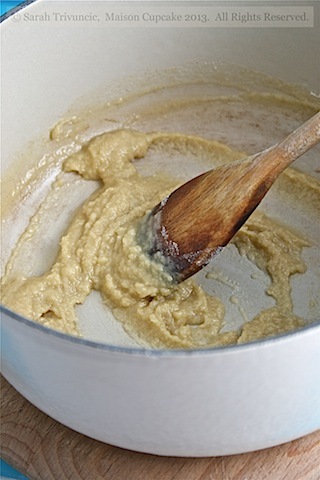 Allow the mixture to come to the boil and then simmer for a couple of minutes until the mixture is thick and comes away from the sides of the pan. 3. Remove from the heat and allow to cool. 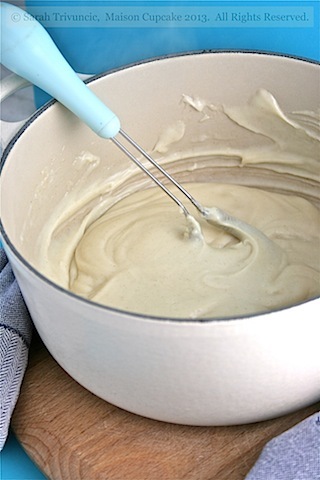 Meanwhile whisk the egg whites in a large mixing bowl until stiff but not dry. 4. 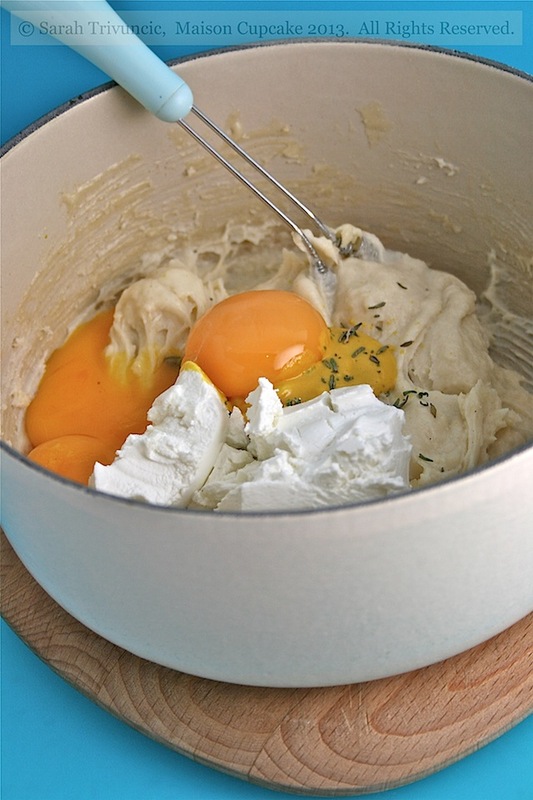 Beat the egg yolks, goats cheese, thyme and salt into the milk mixture. 5. 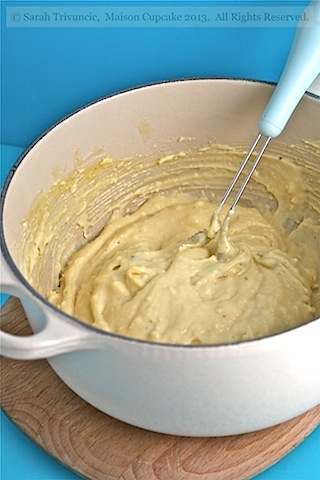 Beat one third of the egg yolk into the milk and egg yolk mix to break some air. Then fold the remaining egg white in one third at a time until just mixed taking care not to over do it and crush the air out. 6. 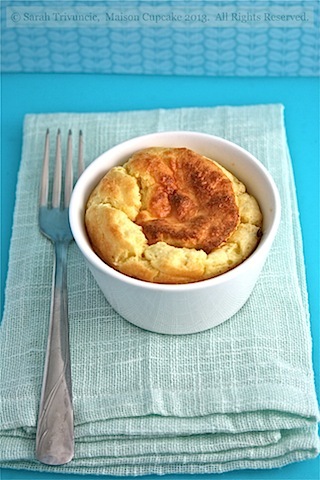 Spoon the souffle mix into your prepared ramekins and bake in the oven for around 30 minutes. 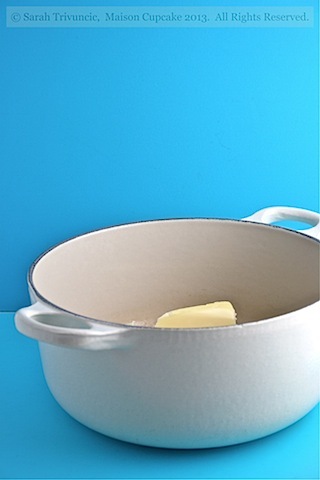 If you make one large souffle it will take longer. Serve the soufflé immediately. Thank you Rosa, I’m certainly tempted to make them again!! 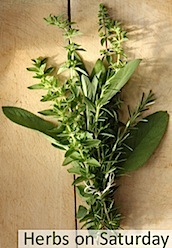 Thanks – thyme and goat’s cheese are a classic combination but I’m looking forward to experimenting some more. They look heavenly Sarah, mine sank too by the time I’d finished taking photos. Love the step by step guide as well, very helpful. Thanks for entering Classic French. Thanks Jen, I’m looking forward to finding out what the next challenge is! 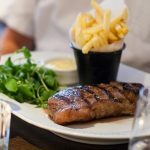 Thank you – I’m pleased you approve! They look really nice, much better than my instantly deflating efforts. You feel so accomplished when you make souffles don’t you?! 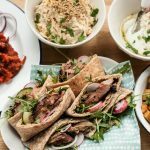 Ha ha – yes they feel a very “cheffy” thing to make! I made a sweet goats cheese soufflé last year so I completely understand both how yummy they are but also how hard they are to photograph. 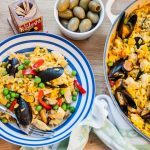 Thought you did well on both counts as recipe and photos look fab. Thanks Fleur – I was using my new light and it makes a massive difference. I only ever make sweet souffles but maybe I need to try my hand at a savoury one. I am making sweet ones next I reckon. 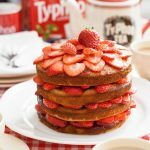 Too much baking powder is never a good idea! Sarah, thank you so much for this – really great to see it step by step. I’ll be giving this a go very soon! Yours look lovely! 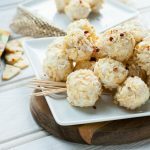 I have tried making them before and they were not so bad, must make again after seeing this! These look amazing and your photos are beautiful.. I must try this recipe. I have the fear :o)) Although I don’t know why – I have made desserts that are a souffle in everything but name LOL! 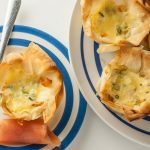 Never tried a savoury one but am a HUGE fan of cheese soufflés – and you have made them look so achievable. Thanks!